It is a unique animal. A reptile that “flies”. Well, almost. It actually glides from tree to tree in search of insects with the help of a wing-like membrane known as “patagium” attached to the sides of the body, supported by elongated ribs. I am talking about the “Southern Flying Lizard”, known to science as Draco dussumieri. “Draco” means “Dragon” in Greek and Latin. The specific name “dussumieri” honours Jean-Jacques Dussumier, a French voyager and merchant from Bordeaux. He collected zoological species from South Asia and regions around the Indian Ocean between 1816 and 1840. Draco dussumieri was identified as early as 1837 and found mention in the catalogue of the world’s reptiles. It is found in South India, specifically in the Western Ghats portion of the region—in states like Karnataka, Kerala, Tamil Nadu and Goa. In fact, it is the only species out of a total 42 grouped in the genus “Draco” that is found in Southern India. In recent years, it has also been reported in the Kanyakumari Wildlife Sanctuary of Tamil Nadu as well as some parts of the Eastern Ghats in Andhra Pradesh. The lizards are arboreal (tree-dwelling). Besides hill forests, they are also found in nearby palm and areca nut plantations. Their home range consists of a few trees. Males are in the habit of maintaining small territories of two to three trees, which they patrol and chase away intruding males. Females move freely within the territory. 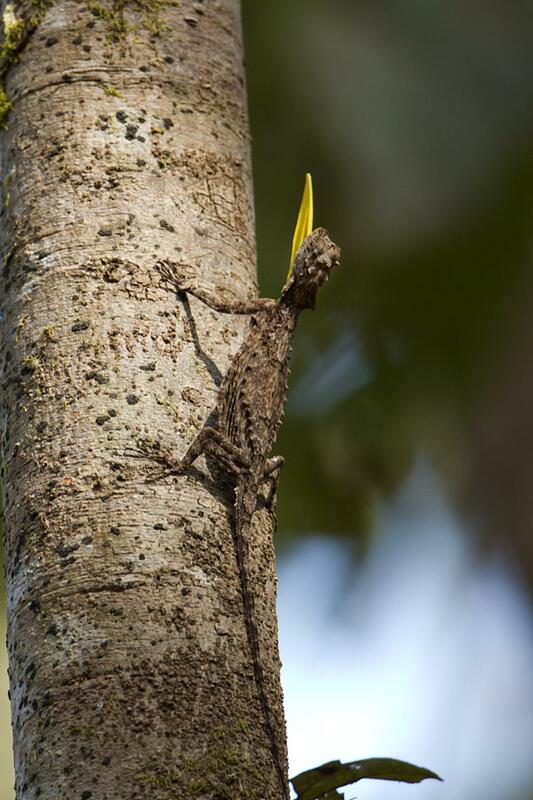 As mentioned earlier, the lizards move during the day from tree to tree in search of insects like ants and termites. They glide by extending the patagium—the flaps of skin attached to the side of the body that are supported by six elongated ribs. They can cover a distance of nearly 10 metres when they glide from one tree to another. The tail acts as rudder, giving direction to the flight. Gliding between the trees is also an escape mechanism. Besides the fact that it “flies”, the lizard is also unique for its colouring. Its colour is brown, with grey patches resembling the pattern of tree bark. Because of this advantage, they are very good at camouflage. As a result, it is very difficult to spot this elusive creature. In case of males, the underside of the wing-like membrane is blue in colour while the females have yellow colour. As the wing-like membranes on either side of the body shine with a brilliant hue, it is also known as “Butterfly Lizard”. These reptiles, being cold-blooded, warm up their body in the early morning sun in order to be active during the day time. Though they spend their entire lifetime on trees, females come down to the ground for laying eggs in the soil. The lizards have a lot of predators. Arboreal snakes, birds like the Indian Golden Oriole and Black-capped Kingfisher and Lion-tailed macaques feed on them. While humans do not feed on these little animals, their impact on them is seen in other ways. Due to habitat fragmentation caused by development because of hydroelectric projects, irrigation dams, railway lines, roads and plantations, there has been a decline in their population. As many of the forest fragments where they live are under the control of private owners, the protection level is highly negligible. The Southern Flying Lizard is a unique animal. The aesthetic value of watching it in flight is very rewarding. Since this lizard species plays an important role in the food chain and its population is fast dwindling, due and urgent measures are to be taken to conserve them. It is very much necessary to promote the protection and restoration of this lizard species through education, economic incentives and inclusion of the Southern Flying Lizard under the Wildlife Protection Act, 1972.